Jaya Lakshmi and Ananda Yogiji offer kirtan, healing mantra music and Kirtronica (kirtan and electronica fusion). Since their coming together in 2010, they have released 12 mantra albums – 4 on Sounds True Records and 8 independently. 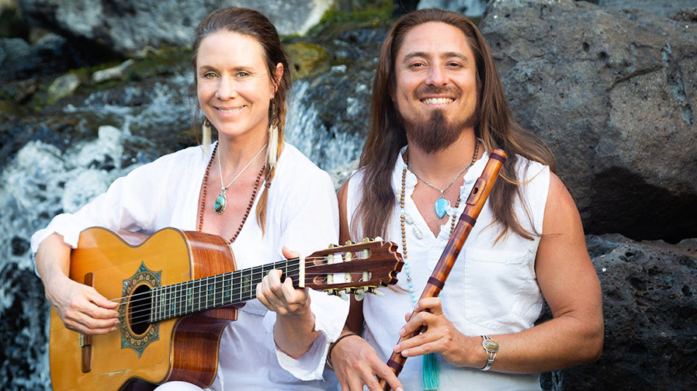 Inspired singer-songwriters of the Bhakti movement, they both perform on guitar, alternating with Jaya Lakshmi on keyboard, and Ananda on bansuri flute. Known for their beautiful weave of English lyrics with kirtan and mantra, their music invokes deep healing and opens the heart to tender sweetness, divine love and devotion. They also teach yoga and have toured nationally and internationally since 2012, holding their own events and retreats. Jaya Lakshmi has regularly practiced hatha-based yoga since 1996, including Pattabhi-Jois style Ashtanga yoga and Anusara Yoga. Since meeting Ananda in 2010 she integrated Kundalini yoga as taught by Yogi Bhajan into her daily practice, regularly attending the Summer Solstice Sadhana gathering in Espanola, NM. Her most influential teachers have been Kia Miller, Tommy Rosen, Sianna Sherman, Janet Stone, Anand Mehotra (Rishikesh, India), and Saul David Raye, for whom she and Ananda occasionally provide music for in their retreats and classes. Ananda has been a dedicated practitioner and teacher of Kundalini Yoga as taught by Yogi Bhajan since 2006. He has completed and taught at numerous holistic yoga and leadership immersions at the Dharmalaya (a holistic yoga, permaculture and meditation center in Eugene, Oregon). In addition to his BA in international and sustainable business, he has a minor in East Asian Religions and studied yoga and yogic philosophy at the University of Oregon and the Dharmalaya. Ananda Yogiji has studied under the guidance of master teachers Gurucharan Singh, Gurmukh, Guru Singh, Krishna Kaur, Ravi Logan and many more. He spent 4 years learning with Viriam Singh and Kaur in Eugene, Oregon. He has attended nine, nine day Kundalini Yoga summer solstice intensives in New Mexico.